Amazon.com Price: (as of 2019-04-18 10:44:21 GMT) Product prices and availability are accurate as of the date/time indicated and are subject to change. Any price and availability information displayed on Amazon.com at the time of purchase will apply to the purchase of this product. These 11.5 gram triple crown poker chips are made of a High Quality Clay Composite Resin with a metal insert for added weight. 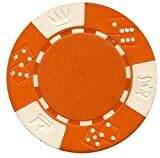 The 3 crown designs are etched into the chip to set this chip apart from ordinary chips on the market. Each chip is made to specifications and is perfectly balanced to give the proper effect. This is one of our newest exclusive designs.